Atal Pension Yojana (APY): Rs 5000/month maximum pension promised under this scheme on a very small monthly contribution appears too less to many. However, we forget that this Rs 5000/month pension can be availed by investing just Rs 210/month. Also, the official motive of this scheme is not to cater to the people in the high income groups, but to those, mostly in unorganised sectors, who do not have access to pension schemes that can provide a regular flow of monetary support after retirement. For those people, even Rs 5000/month as pension would be counted as a good support. Media reports have claimed recently that the government is mulling to raise the maximum pension to Rs 10,000/month under APY. Such a raise would certainly help lakhs of APY subscribers. For now, even Rs 5000/month can prove costly to those who despite knowing the details and benefits of the scheme join late. 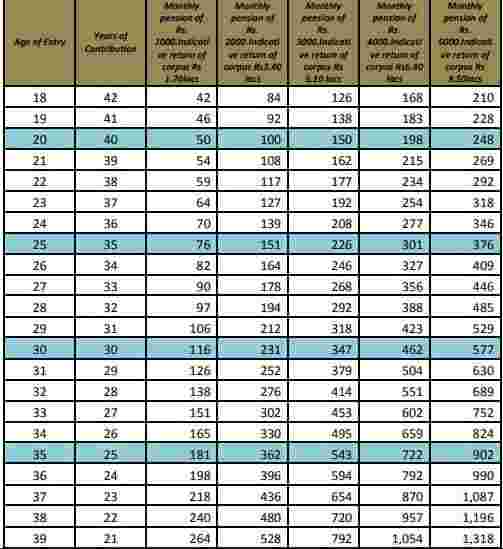 As per the contribution chart of the scheme (see below) published by PFRDA, the minimum investment of Rs 210/month for Rs 5000/month pension can be done only by those joining at the age of 18. The minimum contribution amount per month for maximum pension increases with the increasing age of the subscriber. For example, if someone starts at the age of 30,the minimum monthly contribution for Rs 5000/month pension would be Rs 577. For those joining at the age of 35, the minimum contribution will increase to Rs 902 and to Rs 1318 at the age of 39. APY is a government of India scheme administered by PFRDA through NPS architecture. An Indian citizen between the age of 18-40 can subscribe to the scheme. Monthly contribution in APY can be made through auto debit facility from the subscribers savings bank account. Under APY, the minimum monthly pension between Rs 1000-5000 is guaranteed to the subscriber and to the spouse after death of the subscriber. The corpus is returned to the nominees after death of both. Moreover, if the accumulated corpus based on contributions earns a lower than estimated return on investment and is inadequate to provide the minimum guaranteed pension, the Central Government would fund such inadequacy. Also if the actual returns during the accumulation phase are higher than the assumed returns for minimum guaranteed pension, such excess will be passed on to the subscriber. To provide flexibility to the subscribers of APY with seasonal or irregular income, besides the monthly mode of payment, quarterly and half yearly mode of payment of contributions have been provided in the Scheme. Also, in case of default in payment, a subscriber may regularize the account by paying the overdue amount along with a minimal charge to obtain the guaranteed pension. According to PFRDA, the current number of APY subscribers was 11,565,333 till September 27, 2018.